So, to show how they would look like if they followed her twisted, backwards, bigoted politics, I’ve had the Royals release every player on the MLB or Minor League roster who isn’t a “white” American, thus replicating her “exciting memories” and going only slightly further than her desire to kick out all of the foreigners. And I did this throughout their minor league system as well. And, to make up for the fact that getting rid of all non-white American literally leaves the Royals unable to fill four of their farm system teams, I added a bunch of white guys from Independent Ball to make sure the game will actually run. Now, to be sure, this is still a fairly legitimate MLB roster with some legitimate MLB players on it. However, it most certainly is not the roster of a defending World Series champion. It’s more like the roster of a team that’s dreaming of a .500 record at best but actually almost certainly headed straight to the cellar. And, also, it has Drew Butera as it’s everyday catcher, a strategy which has not worked for a baseball team since at least the 2009 Rochester Red Wings. Say, what is the preseason prediction for Phyllis Schlafly’s dream team? Yes, Phyllis, your 2016 Kansas City Royals (playing with something close to 1944 ethnic makeup) are predicted to go 52-110! Wooo! But, hey, games aren’t played on paper! Let’s see how the Royals do on the field! Oh, and guess what else happened in this game? Alex Gordon got hurt and is out 3-4 months! Gee whiz, Phyllis! Just look at those lineups! Those guys will really put butts in the seats and runs on the scoreboard! After all, foreign players are what is holding the game down, right Phyllis? That’s what you said, and you are somebody who has the great wisdom to endorse Donald Trump for president so how could I ever judge your wisdom/sanity? So, maybe it’ll just take awhile for these Royals to warm up. Let’s speed to the end of April, shall we? Oh… oh my. Look at that. 4-19. And this is with both Eric Hosmer and Mike Moustakas being among the leaders in Slugging Percentage. The season goes on. And on. The Royals win, but not many. Certainly not as many as Phyllis Schlafly no doubt thought they would. It’s almost, Phyllis, as if there is no true difference where a player comes from, and that a great player can come from anywhere. 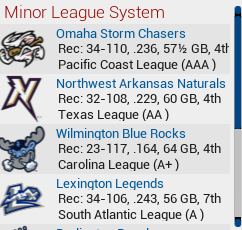 As you can see, the minor leagues are also super out-of-their-league as well, with the exception of the Dominican Rookie League, as apparently your average low-independent ball player is better than the absolute lowest rungs of the minor leagues. So what did we learn today? Well, we learned that Phyllis Schlafly is not only a bigot, but also a horrible baseball mind. We also learned to appreciate just how diverse the 2015 Royals were: they won because of their diversity, with many of their best players being either minorities or from other countries. 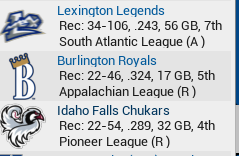 And, as far as the OOTP itself is concerned, we learned that, yes, they do have rosters for every league- I mean, when was the last time you went through Pecos League or Frontier League rosters? Exactly. 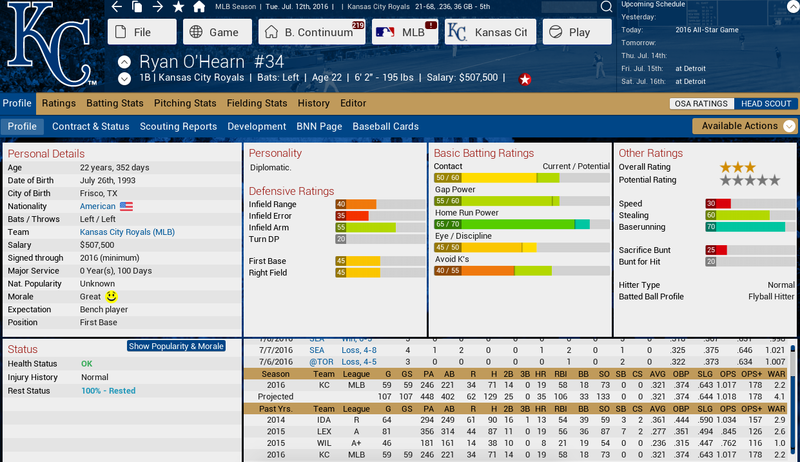 This entry was posted in Baseball, International, MLB, Uncategorized, Video Games and tagged 2016, 30 Posts, 30 Teams, 30 Teams 30 Posts, AL, baseball, Breaking OOTP, Kansas City Royals, Major League Baseball, MLB, OOTP, OOTP Baseball, Out of the Park, Out of the Park Baseball, Phyllis Schlafly, Royals, video game by danglickman. Bookmark the permalink.